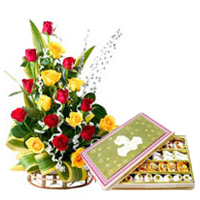 Send Flowers and Sweets to India through our website and help your dear ones celebrate special occasions whether it is Birthday, Wedding, Anniversary, and Mother’s Day, Father’s Day, Housewarming party or any other celebration. Gift your loved ones gorgeous Flowers from our online shopping store that include Lilies Bunch, Orchids Bouquet, Carnations Basket, Gerberas in Vase, Roses Arrangement and various other Seasonal Flowers. Along with Flowers we also house Assortment of Sweets like Kaju Burfi, Badam Halwa, Soan Papdi, Motipak, Motichoor Laddoo, Kesaria Peda, Rasgulla Tin, Gulab Jamun and many more Haldiram special Mithai at most reasonable price. Place order for Same Day Delivery of Flowers and Sweets in India and get On-time Delivery within 4-6 hours to all big n small cities of India such as Mumbai, Pune, Chennai, Kolkata, Amritsar, Mysore, Patna, Guwahati, Gwalior, Varanasi, Jabalpur and all across the country without incurring any Extra Delivery Charge. 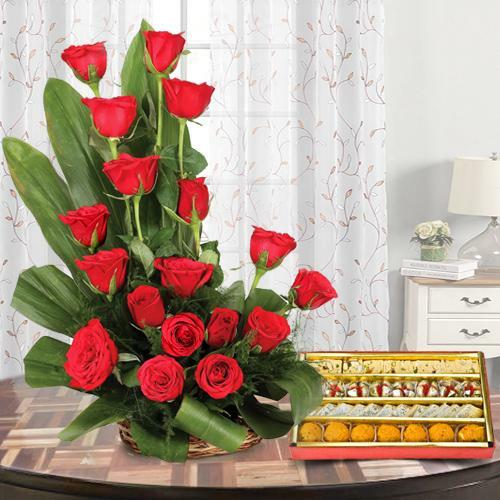 Spread smile on your special ones face by Sending Flowers and Sweets to India from our e-shop. 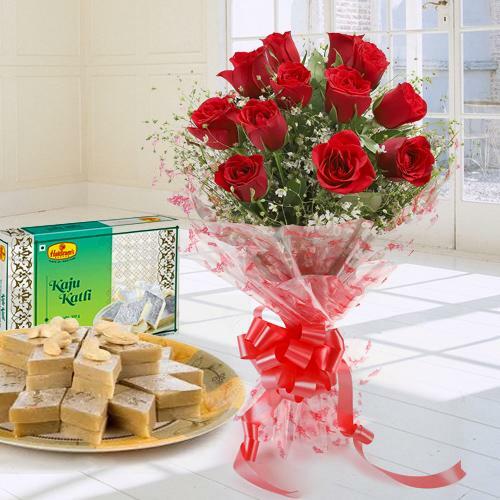 Have a glance at our amazing Combo Hampers that includes Mixed Roses Bunch with Haldiram Kaju Katli, Gerberas Bouquet with Motichoor Laddoo, vibrant Daisies n Lilies in Vase with Box of Soan Papdi etc all available at a pocket friendly price for occasions like Diwali, Holi, Bhai Dooj, Id-Ul-Fitr, Raksha Bandhan, and many more celebrations. Book your Order Online for Same Day Delivery of Flowers and Sweets in India and get assured Delivery to your desired location with Free Shipping. 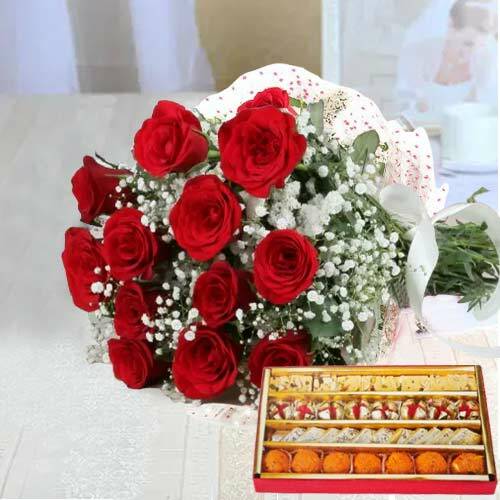 Send Flowers and Sweets to India Online and surprise your loved ones on special occasions or festivals be it Birthday, 25th or 50th Anniversary, Diwali, Holi, Rakhi, Bhai Dooj, Christmas, New Year etc. 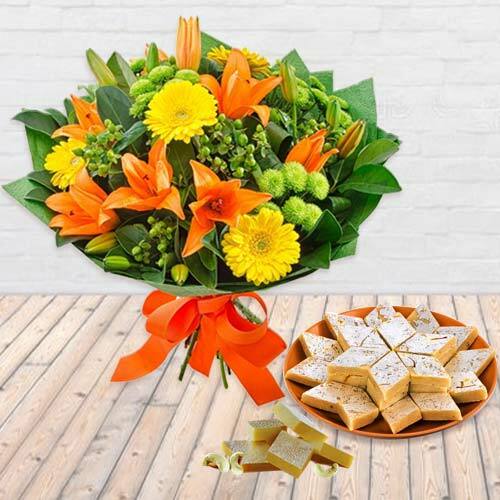 We have come up with endless choices of Floral Gifts combined with Sweets collection for you such as Seasonal Flower Bouquet N Kaju Roll from Haldiram, long stem Red Roses in Vase with Gulab Jamun Tin, Oriental Lilies Bunch N pack of Soan Papdi and lots more. Our Floral Arrangements are hand-designed by Local Florists and Sweets are procured from well-known Mithai Shops. 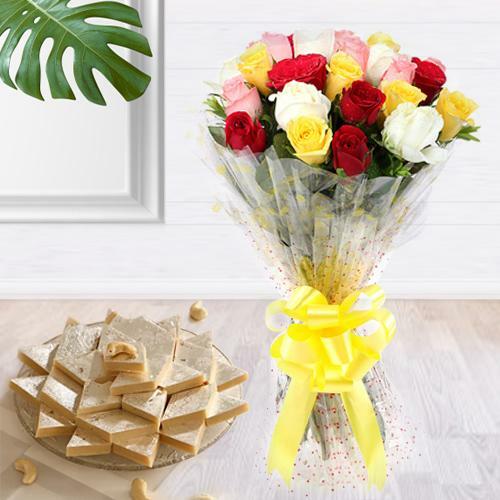 You can place Order Online from countries like USA, UK, Canada, Australia, Malaysia etc and get Today Delivery of Flowers N Sweets anywhere in India within 24 hours without any extra shipping charge.